Let’s say that Bob has a list of 5,001. And Polly has a list of 999. Bob has an average open rate of 10%. Polly has an average open rate of 50%. Both have, on average, 500 people reading each of their emails. Just a little reminder not to be disheartened by a smaller list size. List size is a pretty meaningless number without open rate. BUT Bob is also paying $50 a month more than Polly, for exactly the same number of people reading his emails. To be more of a Polly than a Bob, you’re going to want to delete (*deep breaths*) subscribers who aren’t engaging with your emails (opens or clicks). ConvertKit have totally written a help article about this here, but if you’re anything like me, the thought of deleting your subscribers is utterly terrifying, and you want put a few more safety nets in place to ensure you don’t accidentally delete your biggest fan. ConvertKit’s definition of a ‘Cold Subscriber’ is ‘anyone who hasn’t opened or clicked an email in the last 90 days and has been subscribed for at least 30 days‘. You’ve also got to remember that open rates in ConvertKit aren’t 100% accurate. If someone religiously reads your email every week but has their phone set to not download pictures (because open rates are tracked by a tiny 1 pixel picture that gets viewed), then they will count as cold, even though they freaking love you. And we definitely don’t want to be deleting them. How often do you send emails? If you’ve sent one email in the past 90 days, and they didn’t open it, well…. you’re being a bit unreasonable to then go and delete them for not being engaged. They had nothing to engage with! Have you significantly shifted direction since the first people subscribed to your list? Have you run your list through BriteVerify (which identifies all the bad/spammy email addresses)? Click here to see my blog post all about this! ConvertKit’s method (of emailing everyone once and then deleting a couple of weeks later if they don’t click) seems pretty harsh, no matter how wonderful and clear the subject line is. I advise sending at least 3 emails to your cold subscribers, over a 1-2 week period, with increasingly firm subject lines. First up we’re going to want to tag all your Cold Subscribers that you’ve got right now. (We do this so that we know exactly who we’re dealing with and it doesn’t get messy with new people becoming Cold). Create a new tag called ‘Cold Subscribers’. Go to Subscribers → and change the dropdown option from Confirmed Subscribers to Cold Subscribers. Select all these Cold Subscribers → Bulk Actions → Tag (and select ‘Cold Subscribers’). Important note: You may choose to exclude certain cold subscribers from the cleaning process e.g. those who have purchase tags or those you haven’t emailed in a long time for some reason. To do this you would create a segment of all Cold Subscribers but not those with are to be excluded from being cleaned. You’d then tag everyone in the segment as a Cold Subscriber. You need to create the Destination URL page on your website. Write something nice about how happy you are that they’d like to continue receiving your emails. I also like to tag them something like ‘Warmed Up’ because it’s nice to see how well you’re doing in reviving Cold Subscribers. I just find it motivational. 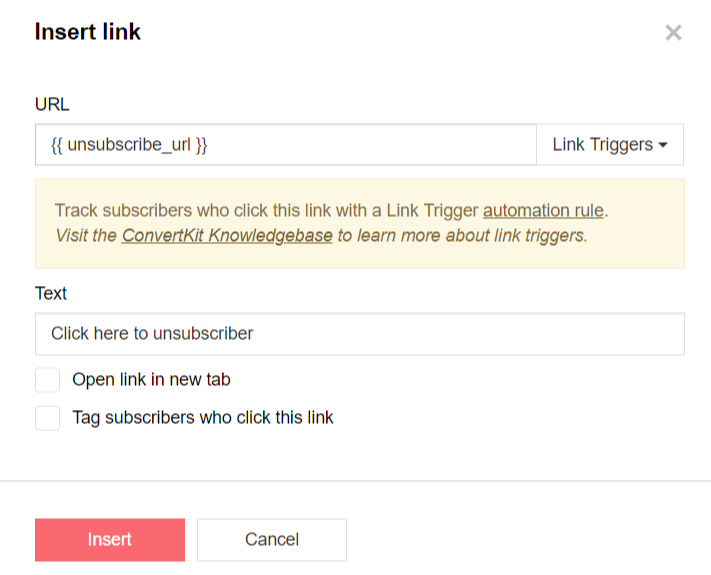 Please note that if they click this they are fully unsubscribed from your ConvertKit account. The delay between these 3 emails is going to depend entirely on how often you usually email your list. If you usually email them weekly, then these emails can probably be 4-7 days apart. If you usually email them monthly, then I’d probably send these emails out over a couple of weeks. One other note on this bit and the emails you send to try and re-engage them… if someone decides at Email 1 that they’re going to do nothing and wait and be deleted… and then they get Email 2 and Email 3 from you, they might be kinda annoyed and report you as spam (which isn’t good). So you need to make sure it’s super clear that if they’ve opened an email, and don’t want to stay on your list, just hit unsubscribe and they won’t hear from you again. Okay, it’s crunch time. These people either didn’t open any of your 3 emails with super clear subject lines, or they opened them and didn’t click to continue hearing from them. This bit is scary, but that’s okay. 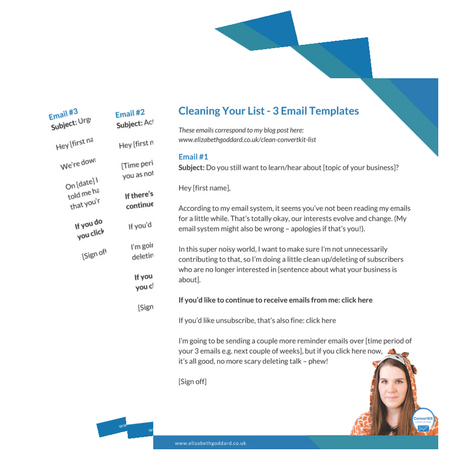 Think of your clean list and soaring open rates! Firstly we’re going to spot check the subscribers who you’re about to delete. Click into the Cold Subscribers tag that we created at the start. And just click into a handful of those subscribers. Double check that they’ve not been opening your emails in their Email History. You can hover over the circles next to the emails and it will tell you if it was delivered, opened, clicked, bounced, etc. If you find any subscribers up for deletion who it looks like definitely shouldn’t have found their way into the deletion pile, you’re going to want to figure out why that is before you delete them. i.e. don’t proceed and delete them! Next, we’re going to want to export that list of Cold Subscribers (the people in the tag). Click into the tag → select all → Bulk Actions → Export. Make sure you’ve safely got that .csv file downloaded from your inbox before you proceed. We do this for 2 reasons. 1) To reassure you that if you’ve made some horrible mistake, you can just import this list back in. 2) When you delete a subscriber, you have no record whatsoever that they were ever your subscriber. (Whereas if they unsubscribe then you do have a record of them). So it might be helpful one day to know who was once a subscriber. Idk. I just feel better if I export before I delete. Okay, you’ve spot checked that everything seems right with the people you’re about to delete, you’ve exported a list of people you’re about to delete, now the moment of truth – you delete them! Click into the Cold Subscribers tag → select all → Bulk Actions → Delete. It’s okay! You just deleted people who haven’t opened or clicked on a single one of your beautiful emails in 90 days and who didn’t care when you very politely invited them to stay on your list three times. You just don’t need those kinda people in your life or on your list! Step 5: Getting your monthly bill reduced! If, as a result of deleting cold subscribers, you’ve come below a subscriber threshold in ConvertKit (so you’ve just dropped under 1k, 3k, 5k, 8k, 10k, etc) then make sure you email ConvertKit to let them know. Your next invoice will be pro-rated to the amount of the month you had more subscribers, and the amount of the month you had less. Your ConvertKit plan/invoice does not automatically downgrade when your subscriber number decreases. You can find out more information about this here and see the pricing levels here. It’s really important that you get the link trigger automation correctly set up in the emails to your Cold Subscribers. (See the gif in Step 3). When you click on a link in the email editor, a little lightning bolt appears next to the url. If you don’t see the lightning bolt, no automation is going to happen, and this is all going to be in vain – womp womp. (Note that you’re not going to have a lightning bolt for the unsubscribe option, that’s just a special type of regular link). In an ideal world, you actually want people to Unsubscribe instead of you deleting them. If you delete them, all their subscriber data is lost forever. If they unsubscribe themselves, then should they re-subscribe again one day, all their tag/form/Email History/etc info will be there. Just something to bear in mind when you’re writing your emails… unsubscribing > deleting. I usually recommend that you exclude the Cold Subscribers tag from your regular newsletters/broadcast emails whilst you’re completing the cleaning process so they’re now only getting emails inviting them to stay on your list. I’ve had some clients offer Cold Subscribers a special freebie to incite them to re-engage. It can work really well. You’d obviously have to rejig the copy of your emails a bit, and you can actually link them straight to a PDF through a link trigger automation rule (and then even on to a more extensive warming back up sequence!). This is a little more advanced though. Happy to chat through helping you do this. I like to create 2 segments so I can see right at the top how I’m doing with the warming up process! One segment is for everyone with the Cold Subscribers tag (i.e. people I’m trying to warm up) and the second segment is for everyone with the ‘Warmed Back Up’ tag (i.e. people who’ve clicked to stay – yay!). Has this blog post motivated you to clear out some of your cold subscribers? Let me know in the comments! 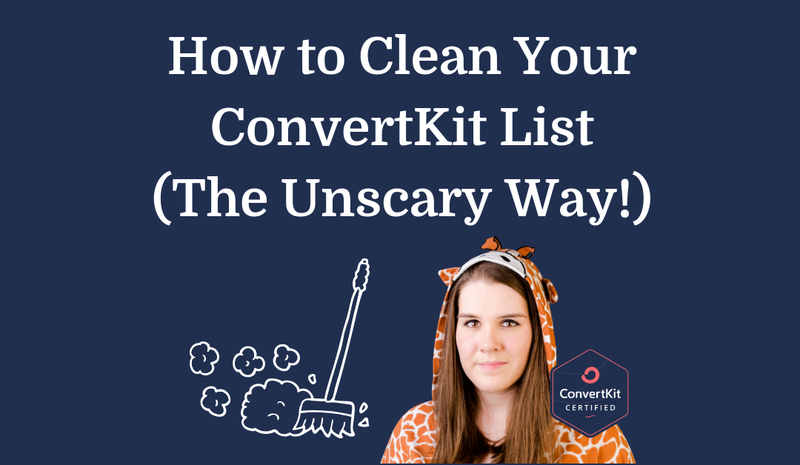 Want someone to walk you through cleaning your ConvertKit list, or even better, just do it for you? Please feel free to contact me about my 1:1 ConvertKit services. Send me the email templates! Thank you for writing this, Elizabeth. I see so many entrepreneurs ruthlessly deleting ‘cold subscribers’, and being very public about doing so, completely ignoring the fact that open rates are a really unreliable measure of who is reading your emails. It’s so important not to offend people by breaking rapport. Suggestions by some gurus that you should use a subject line like, “You’re not reading my emails!” is dangerous – because many people ARE, but the system doesn’t track their ‘opens’. Then they feel grumpy at you getting it wrong. Knowing your audience and putting yourself in their shoes is key. The process you suggest really works well. I found it especially effective to offer a ‘thank you’ on the ‘stay subscribed’ confirmation page, as you suggest. That page is a great opportunity to re-engage people. I also sometimes put a 3 question survey on there, so I can find out what would inspire them to keep reading and how I can help them in the future. Your article suggests practical ways to make sure you only delete people who are genuinely not rocking your Big Message, rather than losing ‘quiet superfans’. Much needed! Thank you for putting it so clearly for everyone. This is such a great post! I’m stuck on step one, however. How do I figure out who my cold subscribers are to begin with? Thanks! This is such great info, I need to clean up my list! The only thing I’m a little confused about is creating Destination URL page on your website. Can this just be any page? Does it have to be public? If you could elaborate any more that would be awesome 🙂 Thank you!! The destination url is just the place they go when they click on the link to confirm they still want to be on your list. It’s a link, so it has to go somewhere. It just has to be a page on your website. Yeah, it does have to be public as they are going to ‘go’ there. I recommend creating a specific page and not just like… taking them to your homepage or something, because otherwise people aren’t sure if ‘it worked’ or not when they clicked. Does that help/answer? Next you want to send a broadcast to all of your cold subscribers to give them a final chance to stay on the list before you delete them. When using a email validating service like Briteverify, do you automatically delete all emails that come back as invalid emails? Do you then have a system for emailing them again to fix the issue? Great question! Once you’ve got the list of invalid emails, you’d just import them to a tag in ConvertKit and then delete everyone in that tag 🙂 There’s no point emailing them – they’re not real people/they won’t reply/you can’t get them to fix it. Thanks so much, Lizzy! I really needed a clear plan. I’m going to re-start regular email delivery for a couple of months and then go through your process. Let’s say that a cold subscriber is going through this sequence. They get email #1 and either don’t open it or don’t click on it. But while they’re in the middle of the cold subscriber sequence they happen to open up and interact with a regular newsletter email outside of this sequence. What then? They’re no longer a cold subscriber according to Convertkit, but they are still going to continue getting the cold subscriber sequence emails. Also once they open one of these emails even if they don’t click on anything they would be taken off of the cold subscriber list. Should I still delete them if they haven’t interacted or no? Okay, so what I actually recommend doing (and I need to update the blog post), is to exclude the cold subscribers tag from all broadcast emails that you send whilst you’re going through the process. And you’re right, ConvertKit will no longer consider them cold, but as soon as you tag all cold subscribers (i.e. you make cold subscribers a static group), then it doesn’t matter if they do click or open another email – they may even open a clean up email, but if they don’t click, they’ll still be considered cold). The only way they can have the static cold subscriber tag removed is if they click to stay on your list – nothing else will count. Does that help/explain? Basically – don’t worry about it because it doesn’t really matter. But I would recommend excluding the cold subscriber TAG from broadcast emails throughout the process. Hello! So I did the steps in your post and sent out my clean-up sequence, but I’ve run into an issue. The third and final email just went out (today or yesterday I think) and I’m getting people emailing me saying that they already clicked the “I want to stay” link in email #1 or #2, and asking why they’re still getting these emails. I checked, and the automation worked as it should: the cold tag was removed from the person, and the warmed up tag was applied. I suppose it’s too late now… but can this be avoided, for next time I clean my list? Do you not find this to be an issue? Hmm, you shouldn’t be having this problem… email #3 shouldn’t be sending to people who clicked email #1 or #2. You sent email #3 to just people with the cold tag? If so, then people who clicked to stay in email #1 or #2 shouldn’t have had the cold tag anymore and shouldn’t have received email #3. What timeframe did you send the emails over? There’s a chance people clicked on email #1 or #2 after you sent email #3… but that would only happen very rarely. The people who complained about getting email #3, when you clicked into them, does it show that they clicked on email #1 or #2? Setting it up and implementing it right now. It’s been so good going through your Seva Club videos and training to get our account organized and growing. Hey, Elizabeth! Thanks for this. Your process was way more clear and logical than the one I found from ConvertKit. Question: Should I be deleting bounced / cancelled subscribers, or are they auto-removed? Just want to make sure I’m not paying for them to be on the list. No need to do anything with bounced/cancelled subscribers. You can’t email them but you’re not paying for them. I don’t recommend deleting them because you then lose that data.